Save The Dates, that is! It's not just a card anymore; the options are seemingly limitless! We all know the usual route, which consists of either the magnet or postcard, both classy and lovely. BTW, I love that these example pens feature my birthday! Or even traditional cards, with nutritional value! 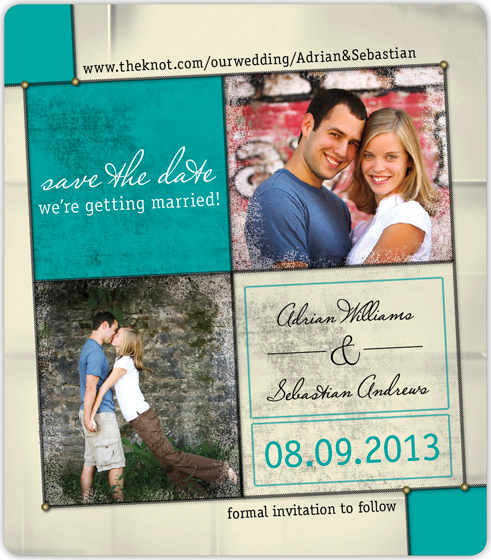 What Save The Dates have you received? Oh man,... I am a fan of the magnet but then again, you know what I put my fridge through. But seriously - I never forget my friends anniversary thanks to that magnet. No joke. With that said - the post cards you featured were HOT HOT HOT! Espesh the first one! I think something you can keep/use is good so no-one will forget. A pen/magnet sounds pretty lame, but everyone will use them and always think of you guys! P.s i got worried when my RSS feed said there was a new blog entry titled STD's...i know your a teacher, but hardly fitting for a wedding! I've never seen those pen std's! They are pretty cool! Ooh, I love those! I think I'd choose either the pen or the concert ticket...how cool are those? I like the tickets but that is because we use them so much in the classroom. But thinking that way makes me think that tickets may in fact be the totally wrong way to go. I am a big fan of the magnet, I love decorating my fridge with pictures of friends! i want to get a scratch-n-sniff! I only ever get postcards. lame. Thanks for all the input!!!! Soo... I agree with Joey. We didn't do Save the Dates & while I really wanted to & it would have been a nice touch, I knew that regardless of what save the dates we chose, they would end up tossed in the trash or forgotten among piles smacked up on refrigerators. And you know how I just *can't* bring myself to spend money uselessly. But if I must... I like the concert ticket! As soon as I saw it, I thought it was so "Vicki." They're cute! Grab My Button! You post mine, I'll post yours! Crowning Victoria Blog by Vicki W is licensed under a Creative Commons Attribution-NonCommercial-NoDerivs 3.0 Unported License.